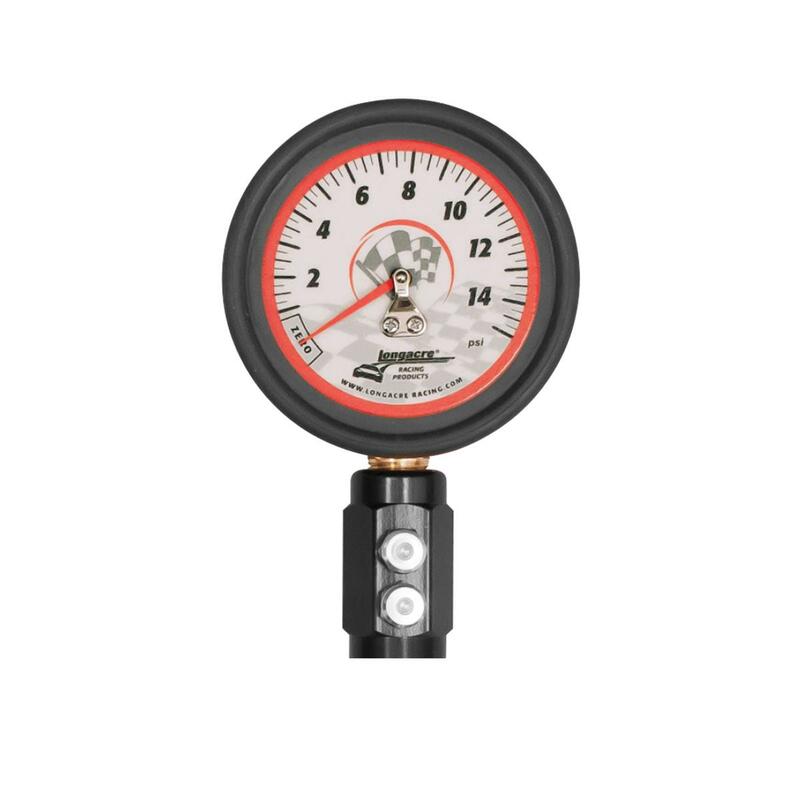 PSI Range ~ The most important decision is to get a gauge that works within the pressure range of the tires that you will be using the gauge on. 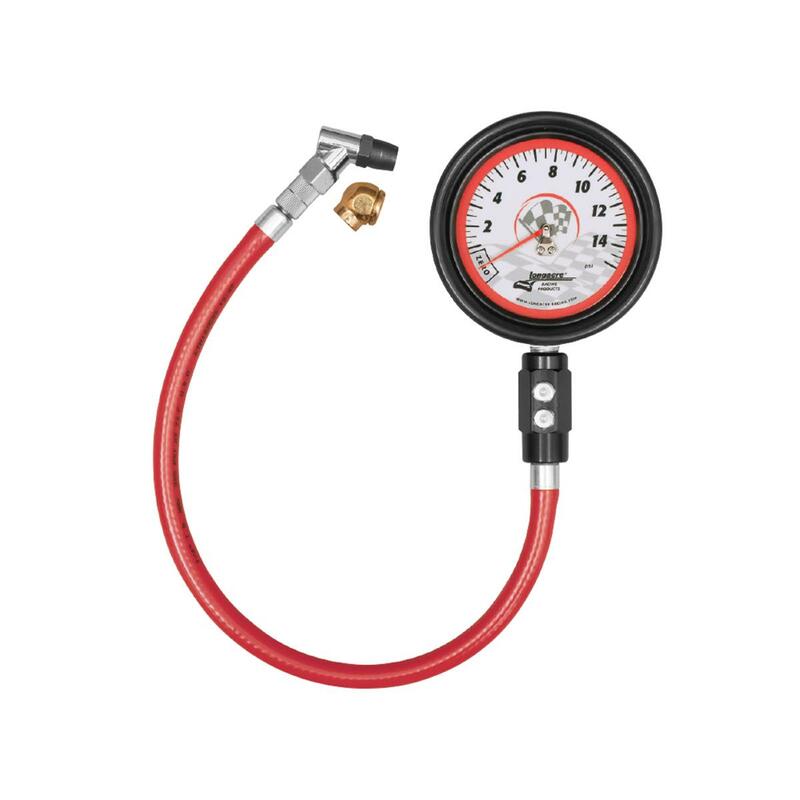 For example, if you run 30 psi in your tires then you should get a 60 psi gauge. 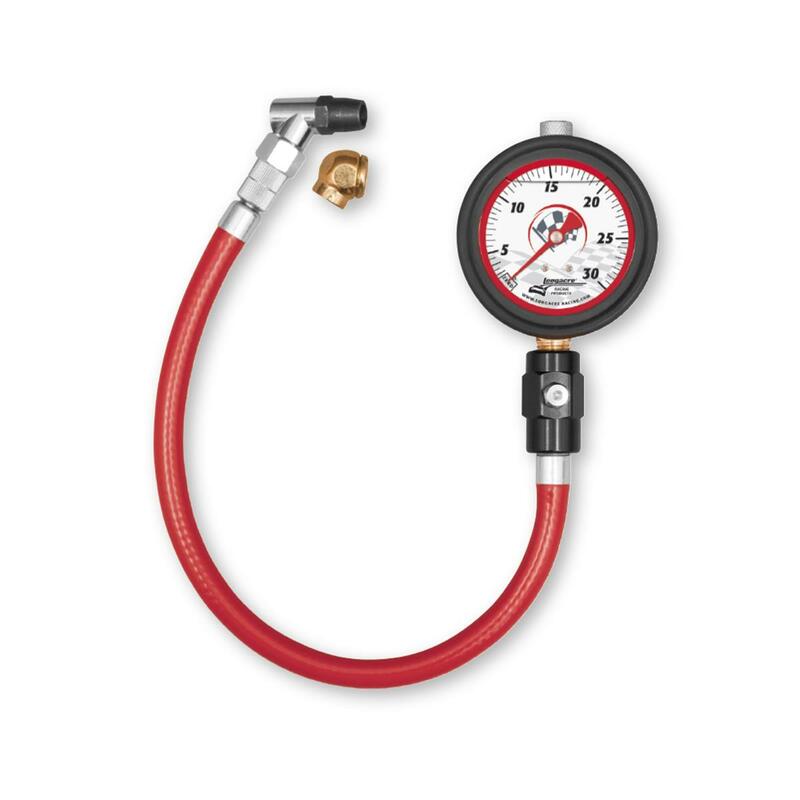 If you run 15 psi then you should get a 30 psi gauge. All tire gauges work best in the middle of their range. 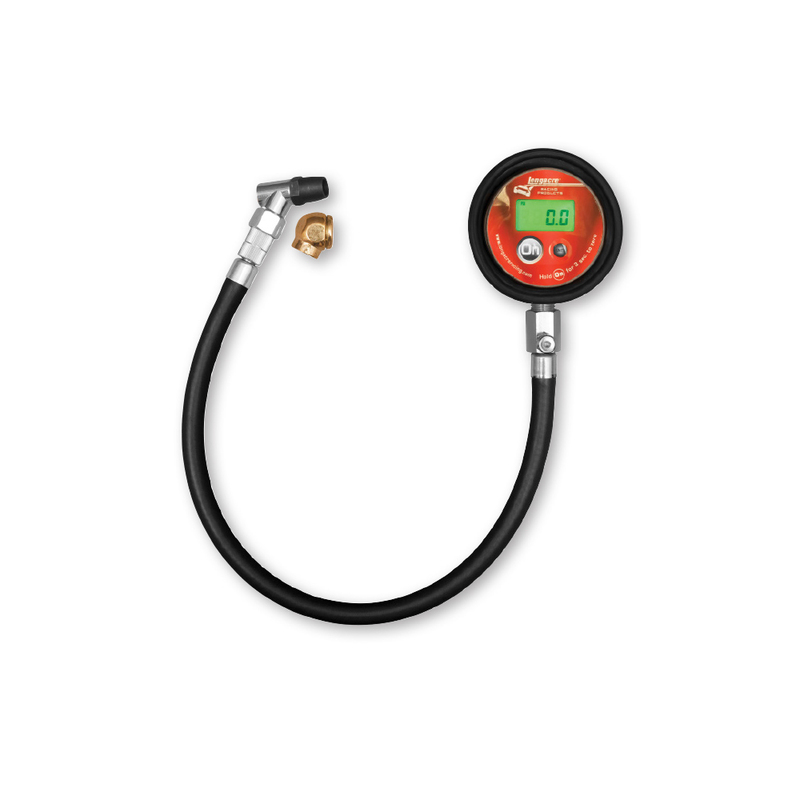 PSI Increments ~ PSI increments are another thing to consider when choosing the correct gauge. The finer the increments, the more accurate reading you will get. 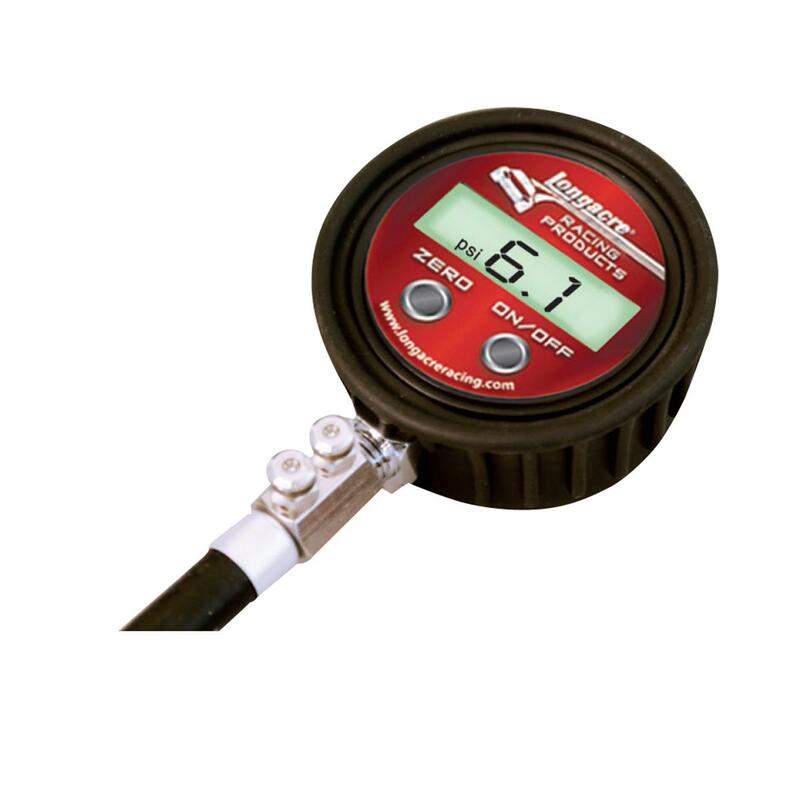 Digital ~ Digital gauges are great, however the cheaper the sensor the less accurate the gauge is. With these gauges you get what you pay for. Analog ~ Analog gauges are a great unit of measurement for the money. Normally, the bigger the face size the better the gauge is. 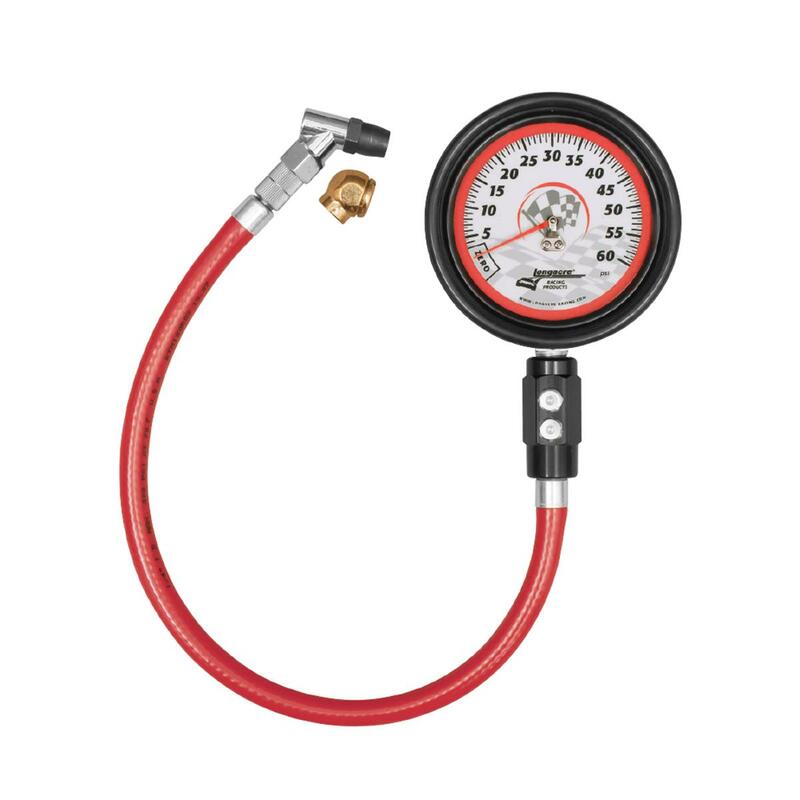 Face Size ~ The larger the tire gauge the more accurate it is, in most cases. Hose Length ~ Longacre has 2 different hose lengths available, 14" and 17" for those hard to reach areas. 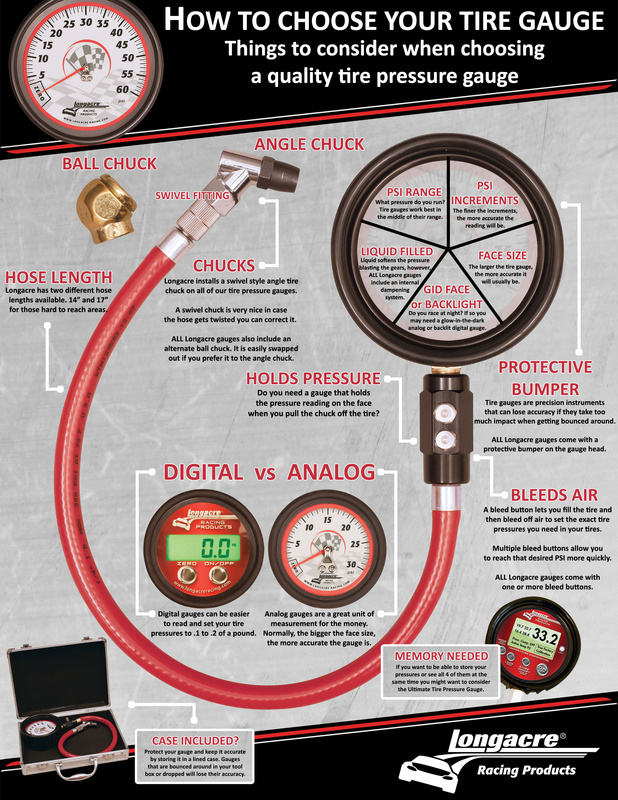 Chucks ~ Longacre installs a swivel style angle tire chuck on all of our tire pressure gauges. A swivel chuck is very nice in case the hose gets twisted up you can correct it. 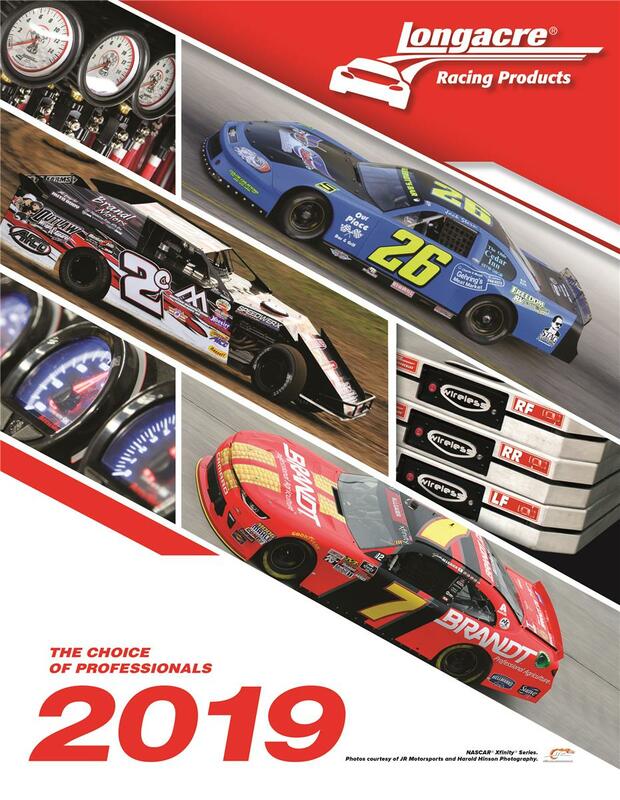 Longacre also includes an alternate ball chuck with all of our tire gauges. It is easily swapped out if you prefer it to the angle chuck. 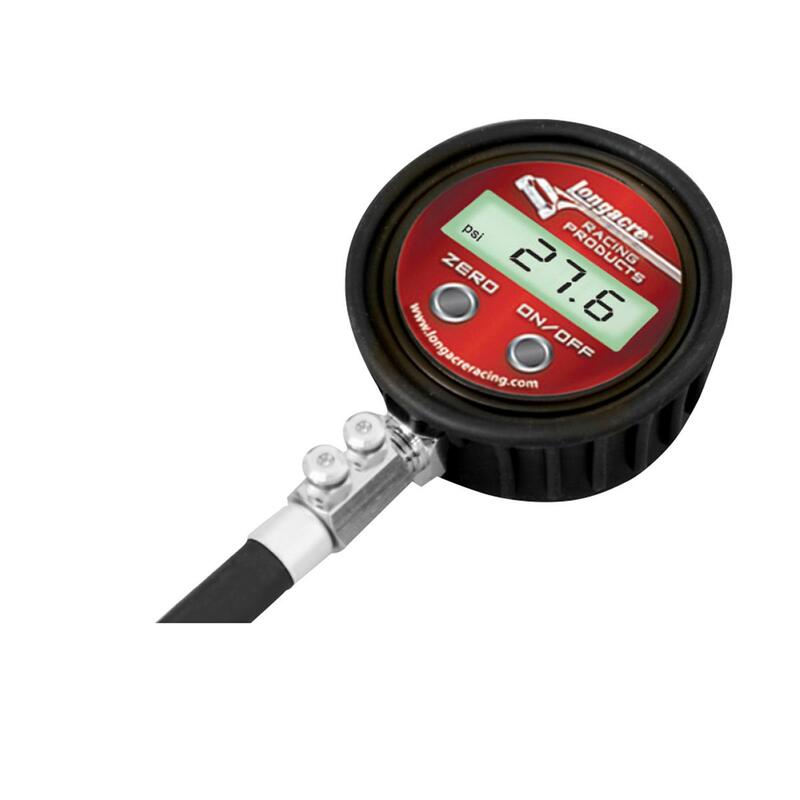 Holds Pressure ~ Do you need a gauge that when you check the pressure you can still read it when you pull it off the tire? 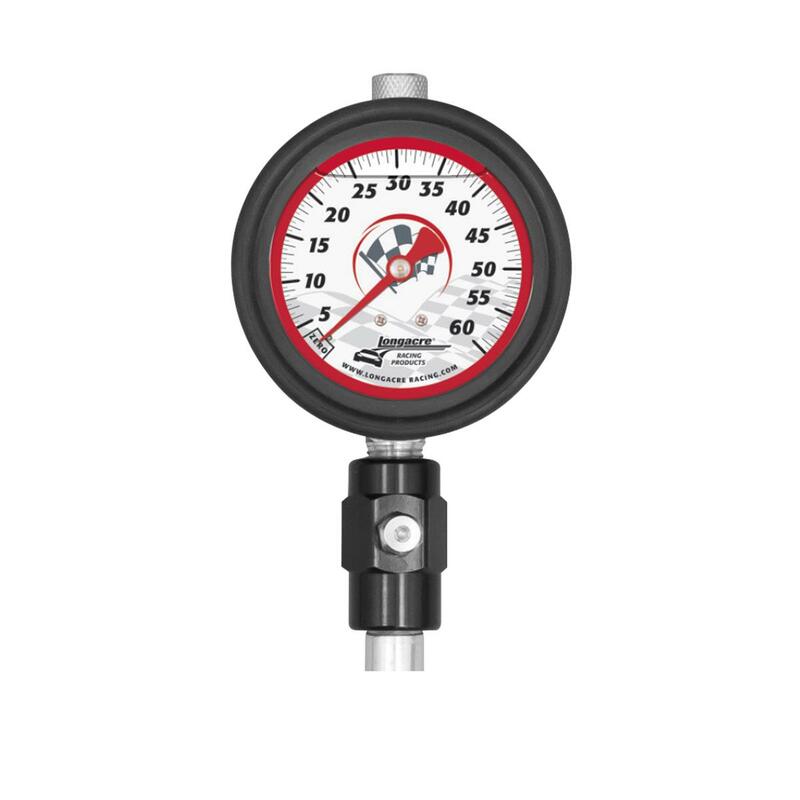 Bleeds air ~ All Longacre tire gauges will allow you to bleed off air when checking the tire pressure. 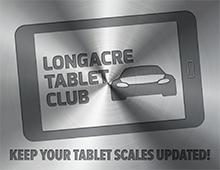 Protective Bumper ~ All Longacre tire gauges have a protective bumper. GID Face or Backlight ~ Do you race at night or in a poorly lit pit area? If so maybe you need a GID (glow-in-the-dark) analog gauge or even maybe a backlit digital gauge. 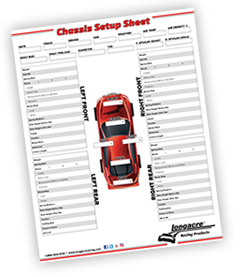 Liquid Filled ~ Here is the scoop on liquid filled tire gauges. Liquid is used to soften the blow of air pressure when it enters the gauge. 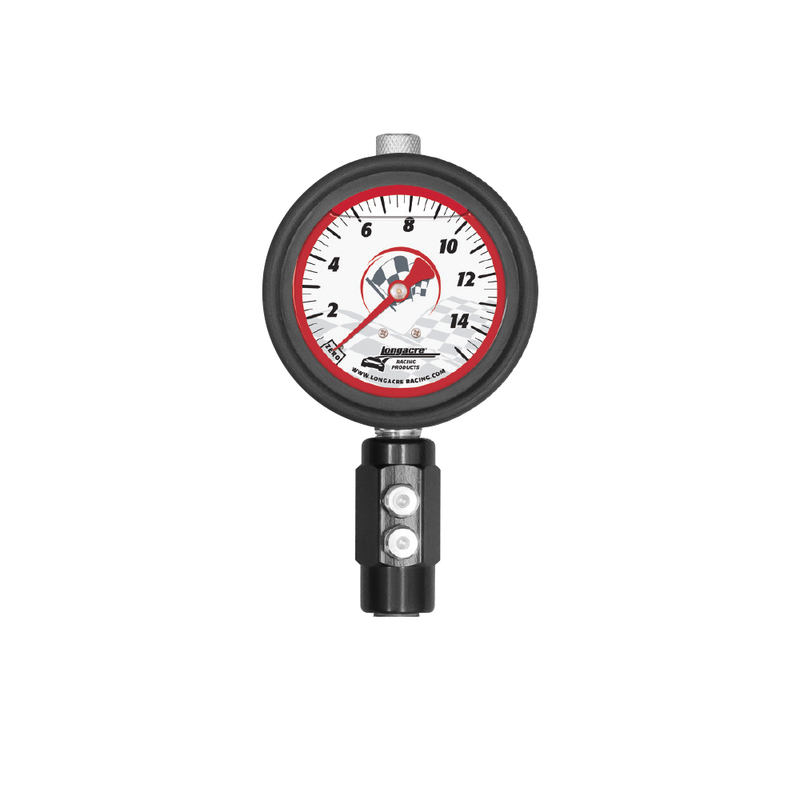 Just think, if you have 30 pounds of pressure then you have 30 pounds of pressure blasting the gears inside the gauge. That abrupt movement inside the gauge is what wears them out. 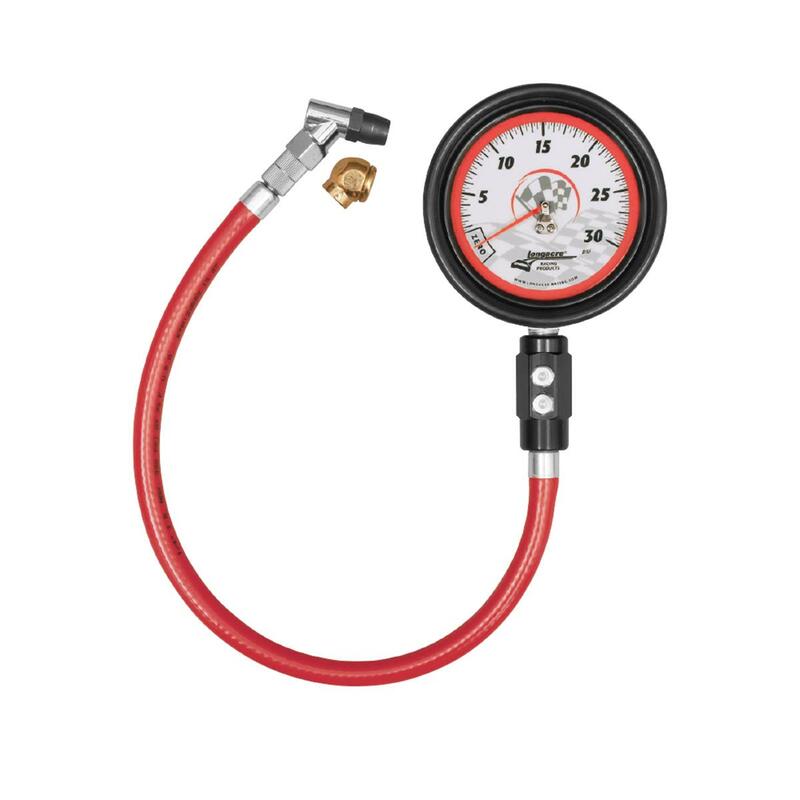 However All Longacre tire gauges have a dampening system built into the gauge head that softens the blow of air pressure, therefore helping to protect the gears. Case Included ~ The most important way to keep your gauge accurate is to keep it in a foam lined case. 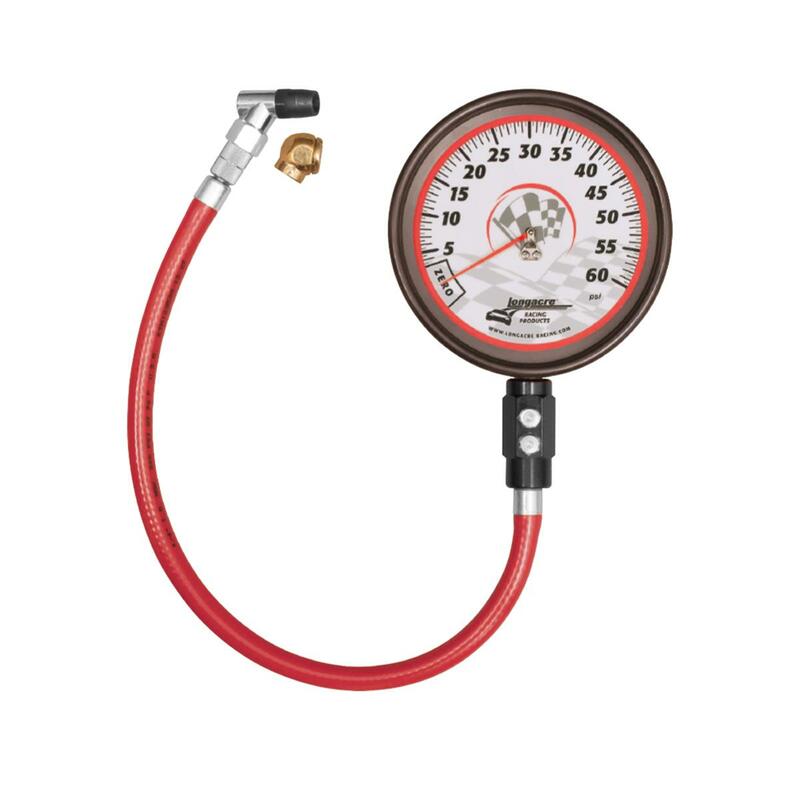 When your gauge is getting bounced around in your tool box while hauling it to the track or getting dropped, it will lose its accuracy. Keep your gauge in a case at all times when possible.